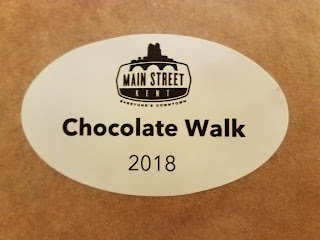 The Kent Chocolate Walk hosted by Main Street Kent has been going on for the last few years, but we've always had another event. This year due to there being so many interested participants the website kept crashing on the day to buy tickets and I happened to snag one when there were about 20 left. Think of the Kent Chocolate Walk like adult trick or treating with no costumes, you walk from business to business picking up chocolate which gives you an opportunity to explore places in Kent you might not have previously visited. 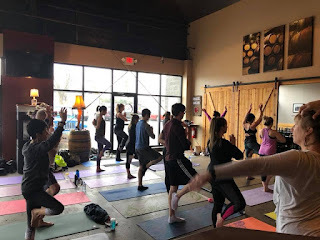 In our case it also helped provide some additional traffic to Kent businesses on a rainy, cold February day -- we stopped at both Tree City Coffee & Pastry for coffee and Belleria Pizza & Italian Restaurant for a slice of pizza after we were done at the Chocolate Walk.